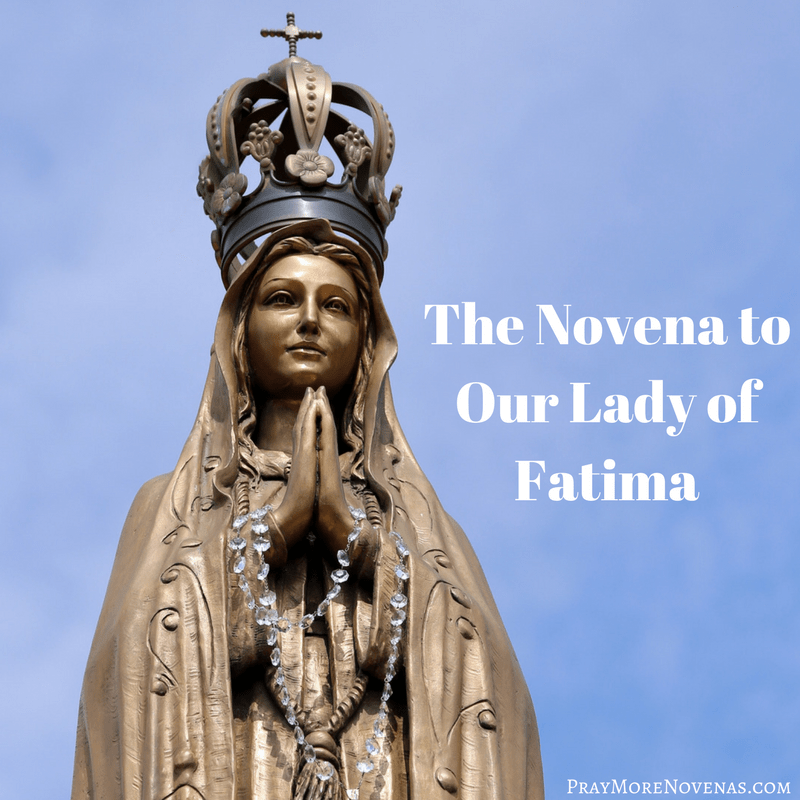 Here’s Day 3 of the Our Lady of Fatima Novena! Our lady of Fatima please pray for Anuradha that she will have a healthy baby and get rid of her moods.Please help her to look after the baby lovingly and carefully. Pls pray for all of us struggling with Cancer. May the Mercy of our Mother in heaven have mercy on us . I pray for the conversion of J.A.S., a man who does not understand the Catholic faith and is trying to convert me to be a Protestant. I pray for a miracle upon his mind and heart. I pray the Holy Spirit guides him. To Our Blessed Mother, Thank you for the beautiful message you have given to me today. You have bestowed to all that have prayed to you many blessings. May you continue to shower all who seek those blessings through your intercession. May God continue to bless all who go to Him. Help all those who seek You provide guidance to those who need to know You are alive in them. Give Hope to our children protect them from the evil that has been ever present in this world that we live in. Let the Children understand that they are of your divinity. Help them feel whole and with purpose. Help us as adults be ever aware of our role in their lives to be their guide to exercise their faith in You that they have nothing to fear as long as they know you are always there. Amen. A special intention for Debbie who has dental pain, dental implants, and adjusting to a lower denture. Help me, My BLESSED mother, with pain relief, patience, and some improvement. I love you, dearest Mother. Please help me. I am a sinner. Lord, keep me safe on my trip and i ask that you watch over my family while im gone. I pray that God’s will can be done for Alan and me. I hope it can be God’s will that we be together. If it is, I pray that he will contact me now or soon to let me know his love for me. Please let us know what your will is dear God, and please give us the strength to accept it. For healing for my left hip damaged in a fall. For the muscle to re-attach to the pelvis, for the bone spurs to dissolve, for easing of the arthritis and degenerated disks. For perseverance in entering the Secular Carmelite vocation in July taking my temporary promises. For my brother, for conversion and salvation, for the diabetic macular edema to be healed so he does not lose his sight and for him to be able to control his diabetes, for a happy death that he never chose assisted suicide. For salvation for my brother’s family. Oh Mary conceived without sin, pray for us. Thank you. Amen. Our loving Lady of Fatima, mother of our Lord Jesus, please intercede for my husband’s current health issue and for my sons moral, physical, spiritual well being. Thank You for all you do for our family, I pray for those families in need of loving care for one another. In the name of our Lord Jesus Christ. Dear Lady of Fatima I want to pray for my oldest son that is in a rehab since August & have til August before he gets out & hes giving me trouble cause he wants out now which I don’t think hes ready. My second son is on a confirmation retreat. My husband to start going to church & Believe. IN Jesus name help all addicts to hear your voice & all the people that don’t Believe to Believe. For the people who finished the rehab course stay on the right path Christ path Amen. For those who getting confirmed feel You. Financial help, too please. Thanks for everything. I Love you Jesus Christ & His mother Mary. For Peace, good health & stop abortion!!! Praying God to give us PEACE in our home.May the Lord enable my husband get job.Praying also for financial breakthrough. Lord may my daughter get the college which her heart desires.Remember my son,Lord,in his studies.Guide me God in serving the humanity with humility and devotion. Dear Lord,open doors for my promotion, cure the sick esp.Auntie Susan and Josephine. May the departed souls rest In eternal peace.Our Lady of Fatima,Holy Mary,kindly intercede for me,amen. Please pray for My friend Lisa F. Who’s children have daily stomache pain and the Drs. Don’t know why. She is also going to need knee surgery. I pray not only for healing but for her to learn the power of prayer over her family. Also pease pray for all those suffering and dying from cancer and alcoholism or addictions especially Hugh Foret and Michael LaCombe. Thank you and God Bless you all! Dearest Lady of Fatima I ask in your Beloved Son, Jesus’s name, that you will bless my son with a good background check that he may start a new job next week that he feels is right for him. Thank you most graciously for helping my son. I would like to pray for my Children to return to Our Lord. For all my family members who are away from God. For healing and strength for my orthopedic and brain problems. For financial problems and relief. That my children will return to the faith. For special intentions. Dear Blessed Mother, pray that Jesus will have mercy on me and that I will completely trust in him. I pray to you and ask for your help to take a heavy Financial Burden off of me and that the Equity Loan will be paid in full that some how I will receive the financial help that I so need. My son-in-law is an emergency room doctor. Now he needs surgery to have a cyst removed from his spinal column nerve on the 16th. This past Mon. May 2nd ,while flying home with his wife, a man became seriously ill during the flight, still a half hour from landing. When the call came out asking for any medical person on board J. was the only person to come forward, and saved the man’s life. God has blessed him with a kind & caring personality. We are privileged to have him as a member of our family. God has blessed our family, & we know He will be at J’s side in the hospital. Abundant peace to all praying this novena. Please help me with my meeting on Monday with my bosses. Protect me during this meeting, and I pray to you for help in that they will be honest and fair in treating me and they will change their comment and rating. Please I cannot afford to lose my job, please watch over me at this meeting, and I also ask please after this meeting is done, that I find a new job. I prayed for you. ???? I prayed for you Antonella ???? I am commenting to thank you for your Novena Podcasts. I am 70 years old and have a Macular problem with my eyes and it is very hard to read the prayers unless they are in very large print. Your Podcasts makes it very easy for me to hear the different Novenas and I have been praying many thanks to you. God Bless you all. Please pray for all addicts to turn to God. Amen. May Our Lord touch and heal them physically and spiritually. May the Holy Spirit help them to believe in Him. Most Blessed Mother Mary please hear my prayers! Praying for Pope Francis and the all the Bishops in Rome. The Holy Catholic Church throughout the world and especially in Russia. Praying for all Catholics who’ve left the faith due to fallen priest. Praying for your holy priest who knowingly are truly blessed and do not water down the truth of Jesus ‘ s teachings. Praying for my family to be steadfast in your teachings, and show by example. Praying for those who are suffering from ill health, and lost because they are in darkness. I give thanks for the job I just got yesterday. Thank you, Our Lady of Fatima! Today I ask that you heal the deep wounds in our marriage. May my husband find it in his heart to forgive me for everything I’ve done and for everything I did not do. I am sincerely sorry. If it is God’s will for this marriage to survive, I will do everything in my power to make a fresh start and be a more silent wife. Please let him consent to live with me and try again. I pray for my children that are going to be leaders and not followers. Bless them our Lady intersed for them. In Jesus’s name I pray. Our Lady of Fatima please help me to get work so that I can care for my family, amen.